Akash-Shloka wedding: Mukesh, Nita and the Ambani family are gearing up for another big round of celebrations as their eldest son is set to tie the knot in March. Days after daughter Isha Ambani's wedding to Piramal scion, Anand, the Ambani is gearing up for another wedding. Mukesh and Nita Ambani's eldest son, Akash, who is engaged to Russell and Mona Mehta's daughter Shloka, is all set to tie the knot on March 9 at the Jio World Centre in Bandra Kurla Complex. Weeks before the wedding, the parents as well as younger brother Anant reached Siddhivinayak temple to offer the first invitation card to Lord Ganesha. A video of the Ambanis shows Nita and Mukesh Ambani offering the card to the priest, who can be seen placing the card at the deity's feet. 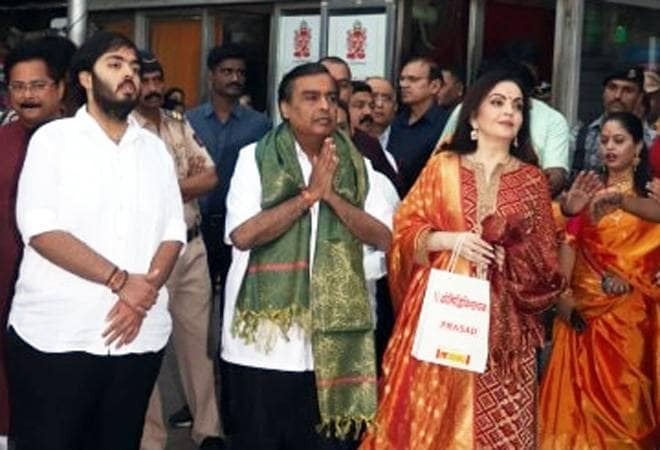 Mukesh and Nita Ambani then went to DMK President MK Stalin's residence to invite him for the wedding. The couple will tie the knot in March, before which Akash Ambani is planning to throw his bachelor's party in St Moritz, Switzerland. Around 500 guests are expected to attend his party, including Bollywood stars Ranbir Kapoor and Karan Johar. While the wedding will take place at the Jio World Centre, the Mangal Baaraat will assemble at the Trident at 3:30pm on Saturday, from where they will proceed to the venue. The wedding is scheduled to take place at 7:30pm. The wedding reception is scheduled for March 11 at the Jio World Centre in BKC. Akash and Shloka were schoolmates before they started dating. Akash Ambani proposed to Shloka Mehta in March 2018. The couple got engaged in June 2018, which was followed by a string of parties that were attended by the who's who of politics, entertainment and business world. In December last year, Akash's twin sister, Isha Ambani tied the knot with Anant Piramal in Mumbai. The pre-wedding celebrations took place at Udaipur and were attended by some of the biggest names in the world including Hillary Clinton, John Kerry, and Beyonce.